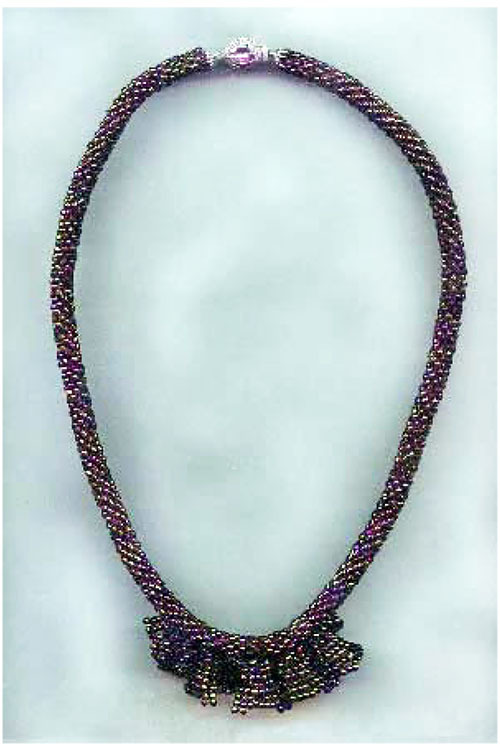 This necklace uses a bead crochet stitch and one type of bead: Miyuki 8/0. Crocheting slipstitch, you can make a beautiful necklace that has a short jabot, and a sterling silver clasp, after adding these accents to the bead crochet tube. A basic understanding of the herringbone stitch is needed to make the jabot; however, instructions include step-by-step pictures for bead crochet and constructing the jabot. If you have trouble starting bead crochet tubes, these directions include an easy method of starting the tube. Also included are instructions for starting the slipstitch chain and connecting it into a circle.